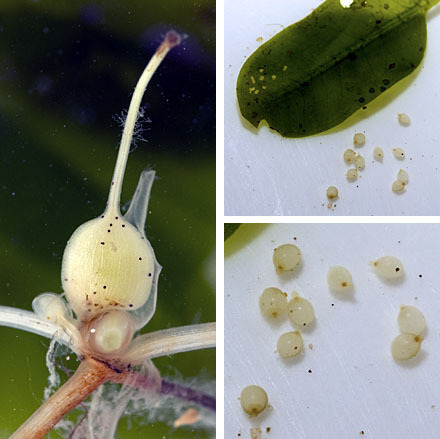 Peiyan.Photography: Great surprises on my first seagrass monitoring. A few days after I became a member of TeamSeagrass, I did my first seagrass monitoring session along the shores of Labrador. 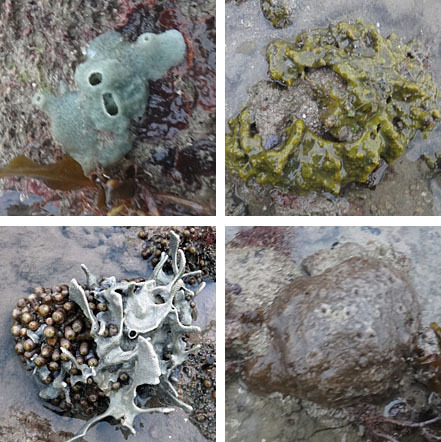 It was also my first time exploring the shores of Labrador beach and there were many other first surprises for me on shore. Ria was my seagrass teacher for today. She taught me how seagrass monitoring was done and the data we need to record on the data sheet. It was rather easy and I picked up very quickly. We started off at site 3, the furthest site from the Labrador jetty. Andy was assigned site 1 to survey. 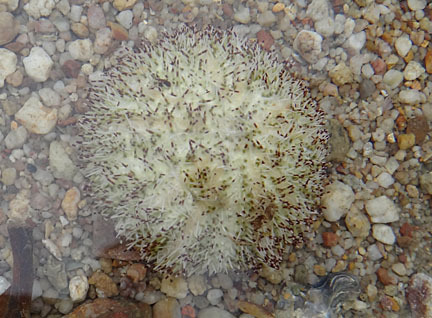 On the sandy part of Site 1, we found a white sea urchin. Ria mentioned to me that it rather unusual to find white sea urchins here on Labrador. We have no idea how it got washed up on this shore. Not sure it the urchin was still alive when we found it. We transferred it into the shallow waters and some spines moved a little. Hopefully the urchin is alive and surviving. However the weather was not in our favour at the beginning of the trip. After taking 3 sets of readings, the fiercely approaching dark clouds and lighting threatened us to retreat back to the jetty, where we seek shelter from the heavy rain and nature's light and sound show. Here you can see the red patch on NEA's weather animation website against the actual weather condition. The weather animation has been a favourite weather guide for many of our fieldtrips as it tells us the movement of clouds. 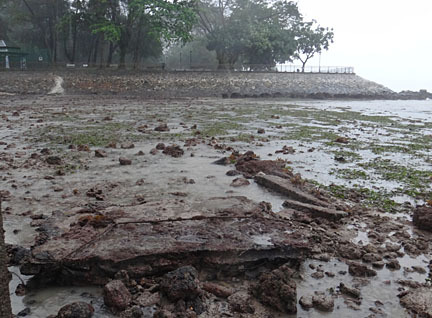 While waiting for the angry clouds to move past the area, the team explored the underside of the jetty and the vegetation next to it. 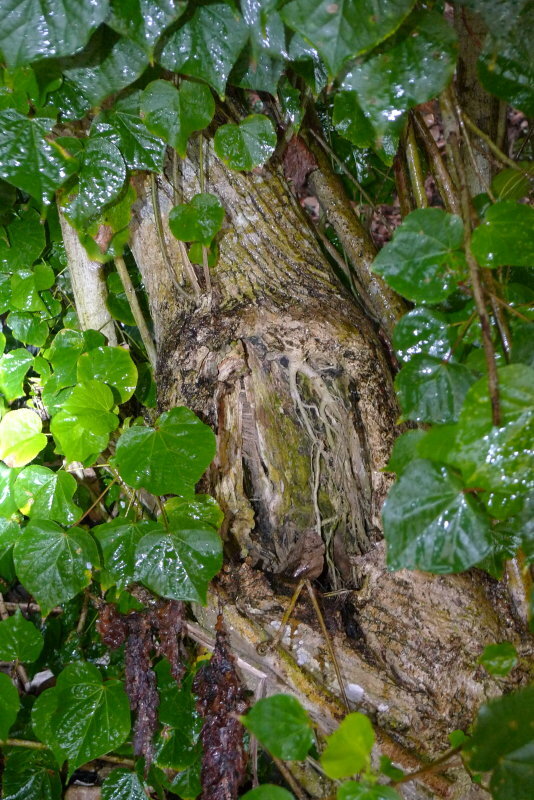 Even tree cavity became interesting as I observe how the rain water flows down the ridges on the tree trunk. After a wait of about half hour, the team is back to the shore to continue with the monitoring session. Rain does not stop us, but lightning does. 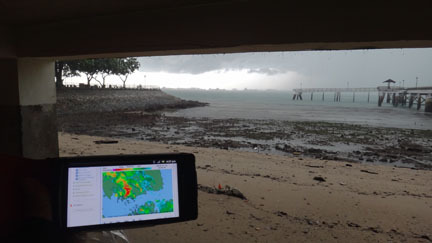 Even in the rain, we worked hard making sure we get accurate data collection. Hard at work in the rain. Animals play an important role in every ecosystem. 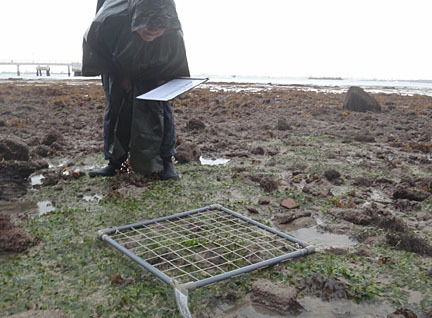 We do not just focus our attention at the seagrass during monitoring, we need to also check for animals that are found with the seagrass within the monitoring quadrant. Sometimes, the animals are so tiny, we need to get close to the ground to examine carefully. 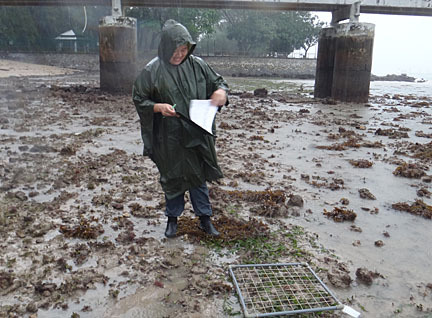 Bending down to get a better look at any animals found on the seagrass. At site 1, the seagrass meadow is huge and lush. 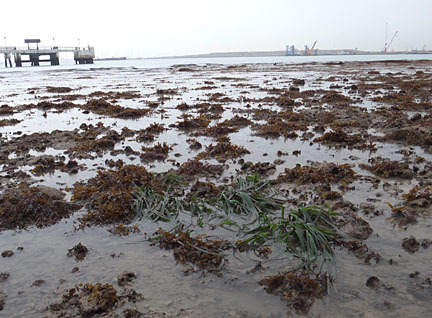 While at sites 2 and 3, the seagrass comes in patches, but they are doing well. 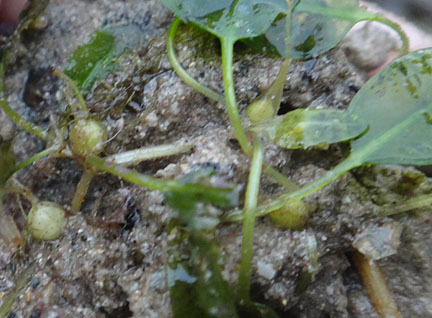 At one patch of spoon seagrass (Halophila ovalis), Ria noticed tiny grains on a few spoon seagrass. 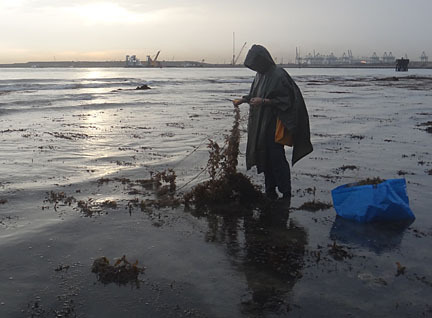 And with some cleaning, they are the fruits of the spoon seagrass! It was not just my first time as a newbie in seagrass monitoring seeing the fruit of a seagrass, it was also Ria's first time seeing the fruit of the spoon seagrass after doing many years of seagrass monitoring. AMAZING! Ria also informed me that one of the fruits had opened when she got home, releasing tiny seeds that sink. Fruit and seeds of Halophila ovalis. After seagrass monitoring, we had some time to explore the shore. 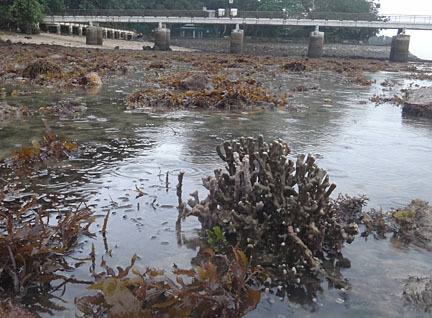 There were a few small corals dispersed on the shore and quite a number of sponges can be seen. I do hope that the Labrador shore will get better. Looking at dead coral fragments on the shore, I can image how it was like in the past and I am very sure that people who have seen Labrador shore in the olden days will find the status now depressing. Nonetheless, this shore is still quite alive with many amazing findings. As the tide was about to turn, Ria found a driftnet about 50 metres long. Driftnets are damaging to the marine environment as it traps animals, entangle corals and eventually kills them. 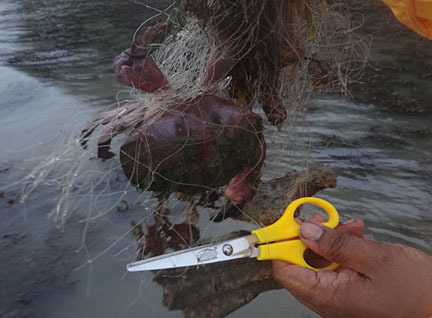 You can find out more about driftnets at the Project Driftnet blog. Me, working on the driftnet to cut into smaller size for removal. Though we did not find any fish trapped in the driftnet, there were many coral rubbles entangled in it. 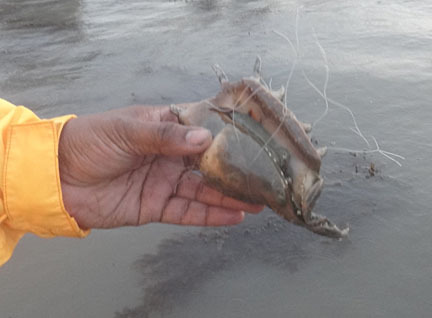 From the driftnet, we rescued 6 spider conch snails (Lambis lambis) and a crab. 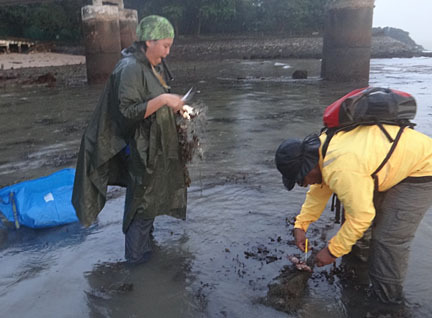 The team helped to free the animals while the tide starts to rise. Cutting away the nets to free the animals. Before we found the driftnet, Andy had already removed 101 BBQ mash scattered along the shore. Initially I thought there were only a few. It turned out that there were over a hundred of the BBQ mash on this shore. Oh my! A great day at the shore of Labrador and great job by everyone in the team. Look at the pile we hull out from the shore. 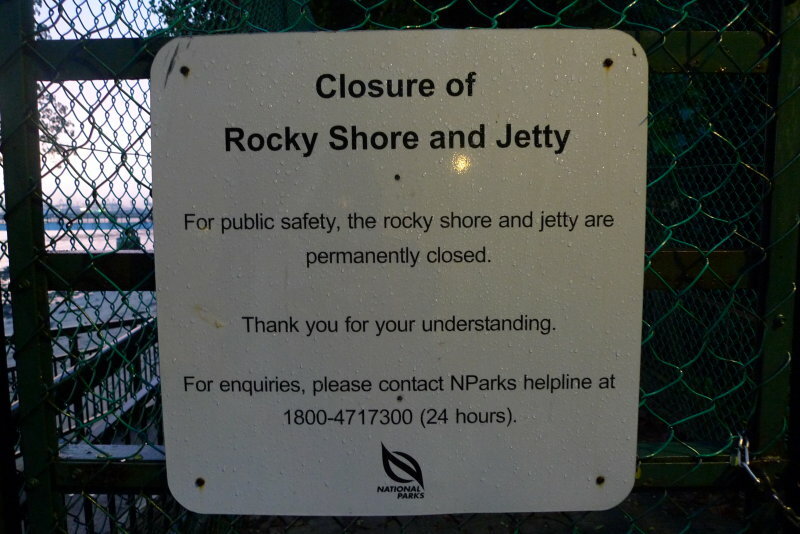 Labrador beach and jetty is closed for public access, but we are given the permission to conduct the seagrass survey from NParks. 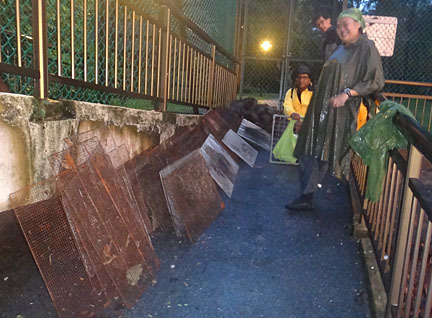 And not just the Labrador rocky shore we should leave the animals alone, we should do the same for any shore that we visit. Animals caught from the wild are not able to survive in captivity and they die quickly. They may be pretty and nice to bring home for your aquarium but they need their natural homes to live. 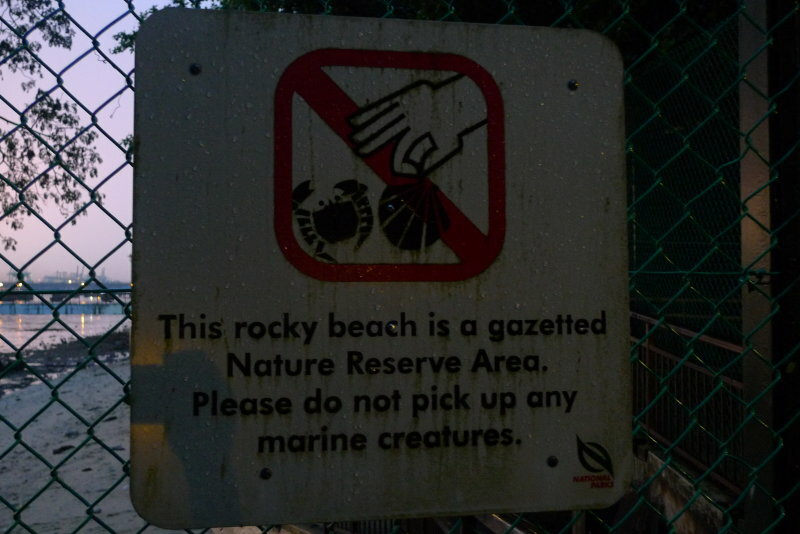 No picking of any marine creatures. Many thanks to Ria for sharing her photos with me to make this blog post possible as my cameras were not waterproof. I should invest in a swimming camera soon. I look forward to another great trip tomorrow.